Southwest Greens Seattle artificial grass will make mowing a thing of the past. Artificial grass construction and installation for your home from SWG Seattle is a great way to have a beautiful turf lawn all year round without the extra work of mowing and fertilizing. With our state-of-the-art synthetic lawn turf and grass, you can custom design and build a practice green in less than two months. Imagine stepping out into your backyard and being able to practice your golf game without the distraction of other golfers! 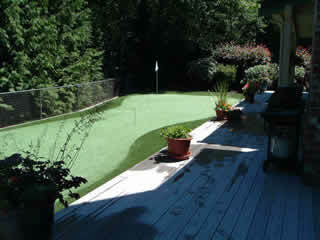 Our residential and commercial products allow you to design a practice area to your exact short game specifications. Enjoy perfectly tailored turf landscaping to show off in your neighborhood, or add an indoor or outdoor home putting green to your lawn. 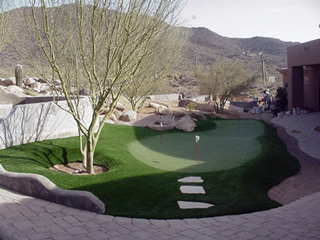 Our manufacturers make exceptional artificial grass and synthetic grass that can be used for virtually any application. Take advantage of our manufacturer’s unparalleled skill to create an area designed specifically for you. Southwest Greens Seattle’s artificial grass for your indoor and outdoor home areas gives you the strongest, longest-lasting and best-looking synthetic lawn turf without the fake look! 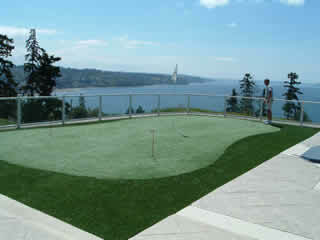 Trust SWG Seattle and our manufacturer to build a putting green for your residential or commercial area. Contact us for a free green consultation today.